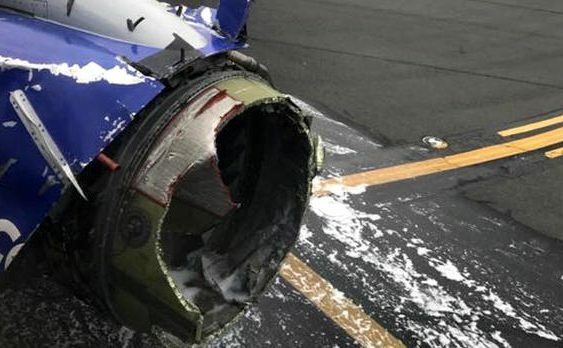 PHILADELPHIA — A Southwest Airlines jet apparently blew an engine at about 30,000 feet and got hit by shrapnel that smashed a window and damaged the fuselage Tuesday, killing a passenger and injuring seven others, authorities said. The plane, a Boeing 737 bound from New York to Dallas with 149 people aboard, made an emergency landing in Philadelphia just before noon as passengers breathing through oxygen masks that dropped from the ceiling prayed and braced for impact. “There was blood everywhere,” Martinez told CBSN’s Anne-Marie Green, adding that people on the plane rushed to help the injured woman while a passenger was trying to plug the hole in the window with no success. Sumwalt didn’t identify the person who had died. An engine on Southwest Airlines Flight 1380 is seen after the Boeing 737 made an emergency landing at Philadelphia International Airport on April 17, 2018. Tracking data from FlightAware.com shows Flight 1380 was heading west over New York’s southern tier at about 32,200 feet traveling 500 mph when it abruptly turned toward Philadelphia. Crews work the scene after Southwest Airlines Flight 1380 made an emergency landing at Philadelphia International Airport on April 17, 2018. A Southwest Airlines flight is seen after making an emergency landing at Philadelphia International Airport on April 17, 2018.